Attestation parade for the recruits of the Maratha Light infantry Regimental Centre was held today at 0730 hrs at Talekar Drill Square of The MARATHA Light Infantry Regimental Centre. A batch of 168 recruits of group 3/11 who successfully completed their training were attested and will soon be going to different parts of the country in the service of nation. 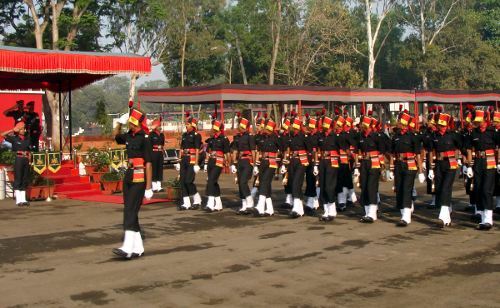 The parade was reviewed by Brig C K Ramesh, Commandant, The MARATHA Light Infantry Regimental Centre. The impressive oath taking ceremony was held in the presence of the National Flag and Regimental Colours. The young soldiers swore to serve their motherland and to protect its integrity even at the cost of their lives. In his address to the newly attested soldiers, Brig C K Ramesh, reminded them of their proud, Regimental heritage and their commitment to the country’s security. He expressed confidence that their training in the Regimental Centre would stand them in good stead in all their future assignments. The parade was commanded by Rect Nimonkar Manoj with the Parade Adjutant Major Yogesh Dhoomal .The reviewing officer gave away various Medals to recruits excelling in different spheres of training at the end of the Parade. The Naik Yashwant Ghadge, Medal, Victoria Cross Medal, Hofe Trophy, Colonell RD Nikam Trophy and cash prize for best Recruit (over all best) was awarded to Recruit Amol Makare . Major SS Barar medal and Trophy for best in Physical Training was awarded to Recruit Ashok Jadhav . For Best in Field Craft Training the Col NJ Nair, Ashok Chakra, Kirti Chakra Medal and Trophy was awarded to Recruit Dipak Pokharkar . Honorary Captain Keshav Rao Talekar Medal and Trophy for Best in Drill was awarded to Recruit Nimonkar Manoj . Sucha Singh memorial cup and medal for Best in outdoor activities was awarded to Recruit Kendre Sharad , Recruit Amit Metange was awarded Naik Namdev Jadhav Victoria Cross medal and Firing Trophy for his performance in the firing. A host of Army officers, Junior Commissioned Officers, Other Ranks and families of the newly attested recruits were present to witness the parade, which was followed by tea for the newly attested soldiers and all audience.